This week begins three weeks of holiday party craziness for us. I don't know about you, but I think our friends all try to hold their own parties. Invitations used to come out in November or December, but they've slowly crept back into October as more of our friends have bought homes and want to host their own shindig. It's pretty much a race to see who can call what date first. I, too, like to host, but I've found my niche in the Cookie Exchange. 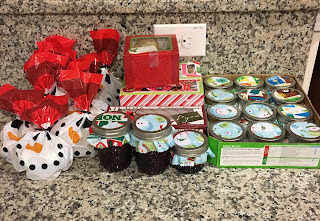 My cookie gifts from the Cookie Exchange and homemade jam for my coworkers! I love to bake and I love to eat cookies. 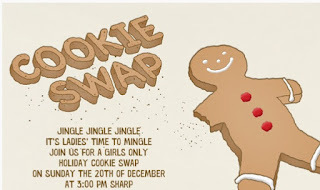 A couple years ago, I noticed that magazines were publishing articles about cookie exchanges. This sounded right up my alley, so I did some research. 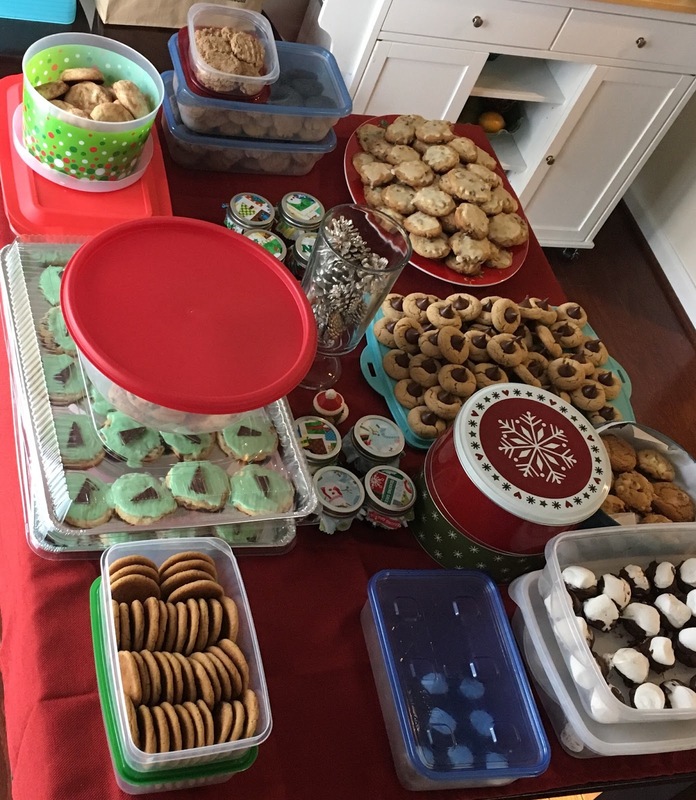 The idea is that instead of people baking a bunch of different cookies to give as gifts to friends, family and teachers, each person bakes a lot of one type of cookie and brings it to the exchange. 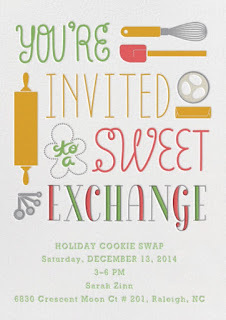 Then everyone "exchanges" cookies. You make gifts with the cookies or you can take them home to your own family. For me, it's great because it's a low key party, I don't have to do a lot of prep and I get to hang out with my favorite ladies! The array of cookies from last year's party! This makes year three of my cookie exchange. I've learned some pointers along the way and thought I would pass them along. Because this is truly my kind of party! I try to send out invites at least 6 weeks in advance. This year, I sent them out November 1 since some people had already started calling Christmas party dates in October. It's crazy! Rule of thumb - give people four weeks early notice and have people list the cookies they are bringing two weeks ahead of the date. That lets everyone else know what will be at the exchange. I also like to hold the exchange on Sunday. It's an easy party to hold in the afternoon and it gives people Saturday to bake. I feel like at this stage of life (post 30), Facebook is just not the route to go for parties. Others still use it and it's okay, but it's not my cup of tea. I like to send invitations, to be creative about it. 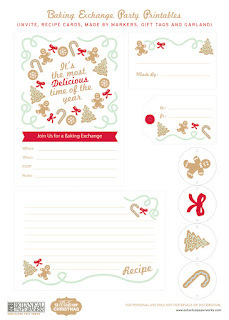 Paperless Post is my choice for sending out e-invites. 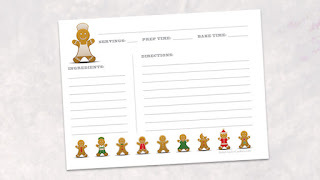 I used them for my wedding save-the-dates and have used them ever since. 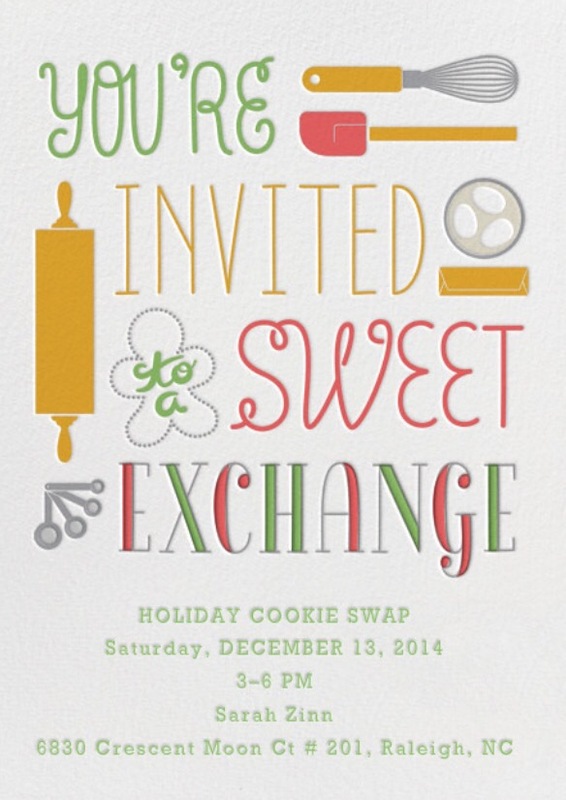 There are so many free options to choose from, even ones specifically for cookie exchanges! Here are some of the invites I've used in the past. Last year's! He's probably my favorite. Ladies only. No babies, kids or men. This is one of the few times during the season that is actually down time. Yeah, it takes a little work in the beginning, but the time itself is really chill. A date for cookie sign-up. 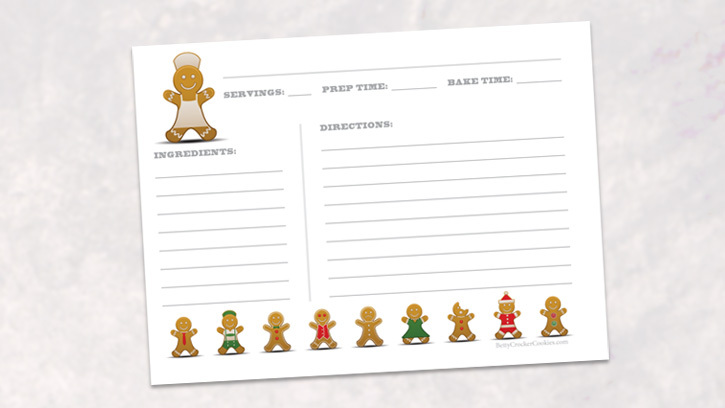 This is necessary so you don't get a bunch of the same cookie. All cookies must be handmade, nothing from the grocery store. They are from gifts, make them nice! People can buy cookies from a bakery (not a bakery in a grocery store) if something catastrophic happens in the kitchen. The amount of cookies to bring. I do 1/2 dozen cookies per person. Some people do 1 dozen per person, but that gets to be a lot. You can also track the invites through the system. It makes life so easy! 3. Buy your wrapping supplies after Christmas. The first year I did this, I had people bring their own wrapping supplies and only bought enough for myself. Only a few people brought their own and they ended up using all of mine. I learned my lesson! 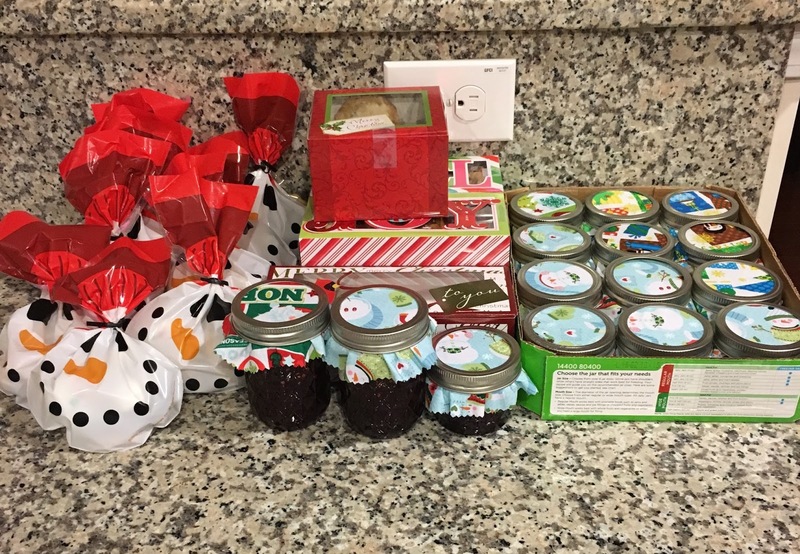 Now, I go out after Christmas and buy a bunch of food gift boxes, treat trays, treat bags, cupcake liners (great for separating cookies out in boxes), and ribbon when it's 50% off or more. You can get a lot for not a lot of money. If you need some now, you can find them on Amazon or in stores at Michael's, Joann's or AC Moore. I also keep what we don't use from the previous year and add it to the stash for the next year. 4. Don't make a lot of food, but have some snacks and drinks. I love to cook and bake for people, so my default is to make a lot. Truthfully, though, most people will just want something to drink and maybe a few things to munch on. Something as easy as Chex Mix works great. I like to also do either a mimosa or a whiskey sour for a pitcher. If nothing else, I'll enjoy it! 5. 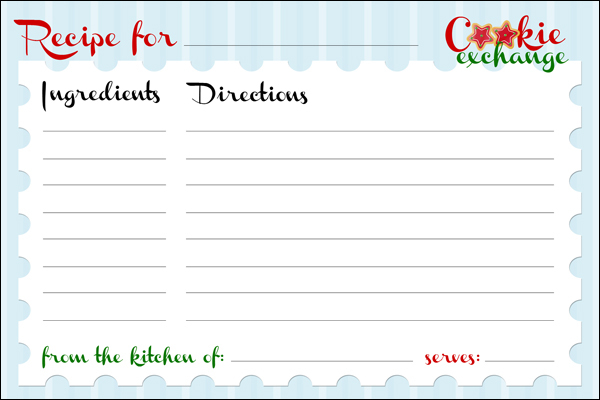 Take the time to print out recipes for your guests. I don't invite a ton of people, about 10. My girls are fun, make good cookies and enjoy sitting down together to craft and eat. 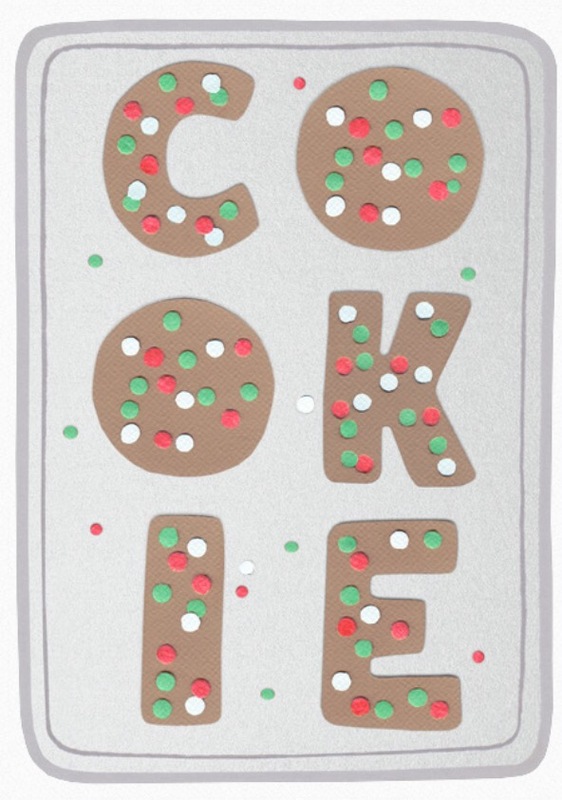 Yeah, it's an efficient way to get a ton of cookie gifts, but it's also a nice break from the insanity of the season. There aren't any kids or husbands or anyone demanding of your time for just a few hours. 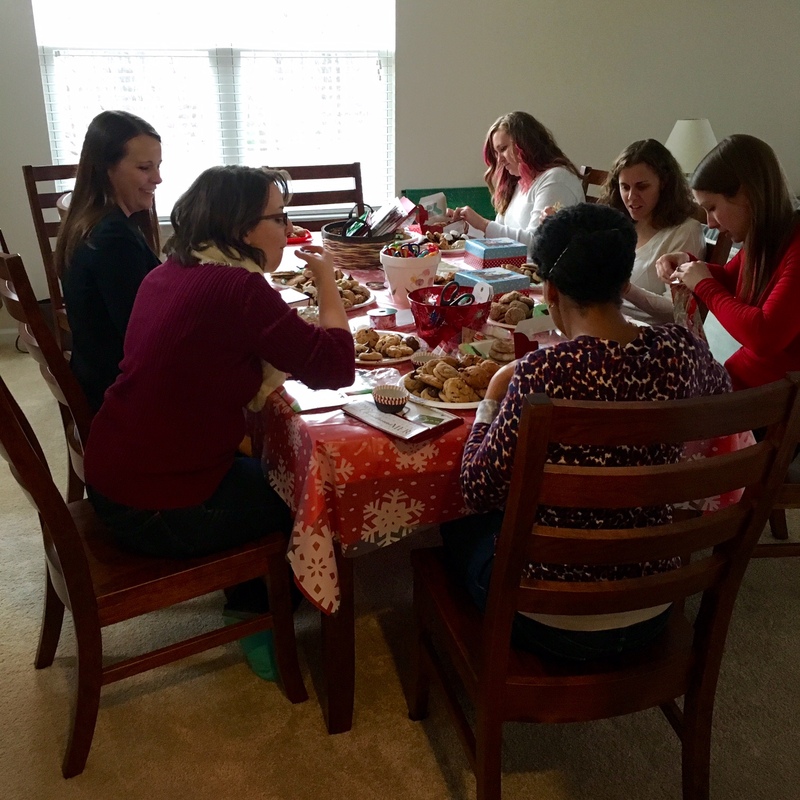 If you like to host holiday parties, like some girl time and don't want to have a super stressful day preparing for a party - a cookie exchange is the way to go! It's honestly one of my favorite traditions of Christmas now! It's such a great time with friends and...cookies!! 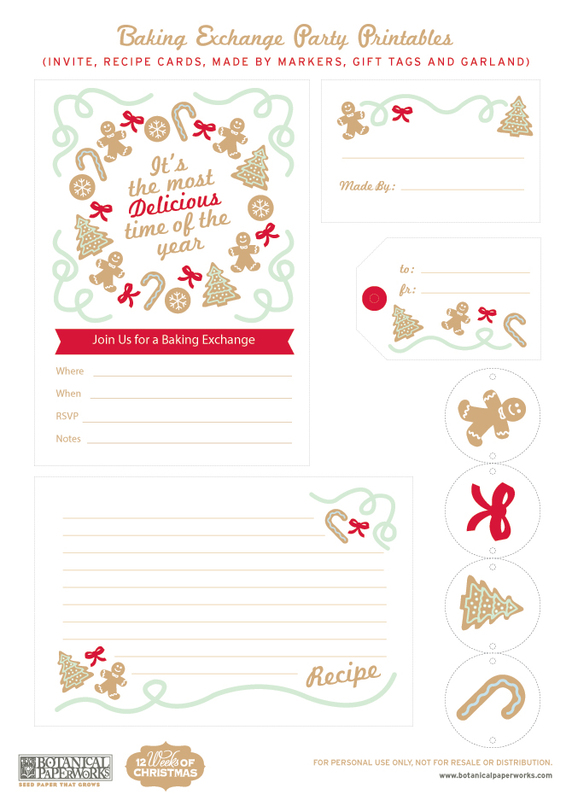 I LOVE cookie exchanges and it looks like you know how to do them RIGHT! I totally agree with you about the no-Facebook invite. Another form of invitation is so much better especially with all the other things going on on Facebook. That's a great tip to have enough wrapping supplies as well. Love this post!! Thank you! I'm glad I'm not the only non-Facebook invite person out there! this is so much fun! i loveeee cookie exchanges! Oh wow, I should not have read this on an empty stomach! Looks fun and delicious! I love holiday parties so much! This is such a cute idea! I've never heard of a cookie exchange. When we get our own home, I definitely want to start having holiday parties so I'll keep this in mind.